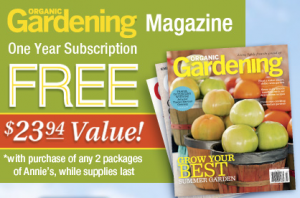 Get a FREE 1 year subscription to Organic Gardening magazine from Annie’s Homegrown when you fill out the form AND send in two (2) UPC from any two (2) Annie’s Homegrown products. Perfect if you’ve bought Annie’s Bunny Fruit Snacks and/or Annie’s Gluten-free Bunny Cookies (currently $2.37/box on Amazon!) for Easter! I would love to participate because we strongly support organic gardening and this looks like a great magazine. We have 6 large raised beds planted right now. It’s great that Annie’s is making gluten free products, but with such a staggering number of children suffering from dairy allergies, it would be 10 times more helpful if Annie’s would stop making all of their products on shared equipment. Fruit Snacks are the only Annie’s products we can buy, but we don’t allow any chewy candies because our son is prone to cavities. I would love to see an offer like this with Enjoy Life products…a much more allergen friendly company! Oooh! An offer like this with Enjoy Life would be wonderful!